Seraph's Little Corner | welcome to my humble garden of memories…. So last month, I was in KL for a short weekend break…. The parents didn’t know until I was at the doorsteps…. Hahaha! In fact, here’s a funny story…. I called the house phone to get someone to open the door…. Me: eh P, open the door…. Later I found out the 2nd half of what happened after my sister put down the phone…. Dad: who was on the phone? Sister: err, I don’t know…. A girl just asked me to open the door…. Sometimes we get so caught up with modern technology and new innovations that we forgot the simplest things in life…. Like for Mr. Pig here, he could have just grab a ladder…. But that aside, this was a hilarious video! Which method did you find it the funniest? I liked the one where he used the toilet plungers…. hahaha…. Remember my on-going complain of a surface-of-the-moon facial skin? 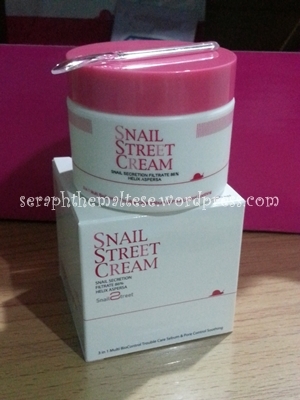 So some time back, I bought this Snail Street Cream from HiShop.my. Here’s what the website claims…. I didn’t review about it because the website says that “For most skin conditions, it may take anytime between 1 to 4 months of daily use (twice a day) of Snail Cream to see visible results” so I decided to give the product its fair share of use to avoid bias…. The short version of my verdict? Some yea, some nay…. Let’s look at it in more detail….